AMD released the ATI Radeon HD 5700 series of graphics cards this week, which means that AMD has successfully launched four brand new DirectX 11 graphics cards in less than a month! It all began on September 23rd when AMD released their 'Evergreen' series of Radeon 5800 graphics card with the Radeon HD 5870 for their high-end offering at $379.99. Exactly one week later they released the Radeon HD 5850, which featured two fewer SIMD engines and lower clock speeds, but came at a lower price point of just $279.99. While those cards received the praise of both the media and the community for their amazing performance they are priced higher than what mainstream gamers are willing to pay. 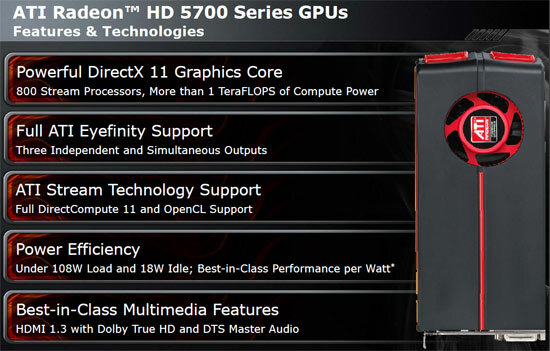 On Tuesday all that changed with the release of the ATI Radeon HD 5700 series. These new cards were known internally as Juniper and are aimed at mainstream gamer due to their friendly price points. 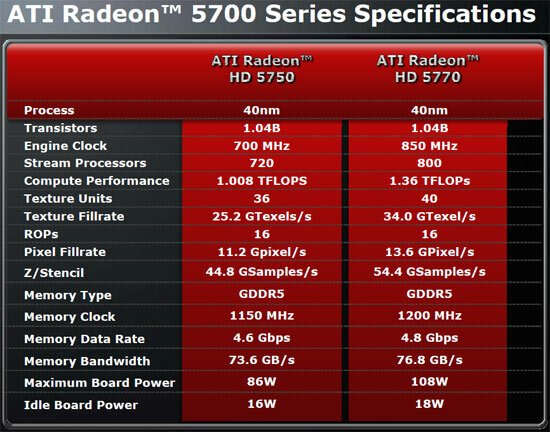 The ATI Radeon HD 5750 comes with a SRP of $109 with 512GB or $129 with 1GB of GDDR5 memory, while the Radeon HD 5750 is priced a little higher at $159. With the release of these two graphics cards AMD's lead and dominance in next-generation DirectX 11 graphics technology is daunting to say the least. NVIDIA has yet to release any DirectX 11 graphics cards and rumors of Fermi (GT300) being delayed still run rampant today. The new ATI Radeon HD 5700 series of graphics cards offers virtually all of the same features of 5800 series, but will perform a little slower as the cards have fewer SIMD engines. 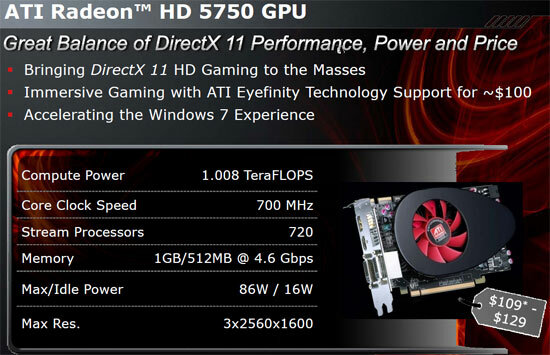 The general features of the Radeon HD 5700 series is still amazing though as you can see by the bullet list below. 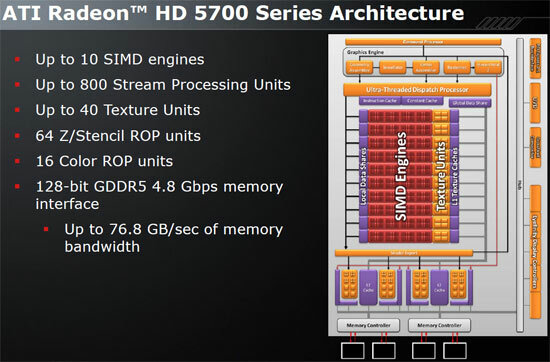 The AMD Radeon HD 5700 series architecture is really the same as what is on the 5800 series as you can see from the block diagram above. AMD basically just took the die used in the Radeon HD 5800 series and cut it in half. To be more specific, the Radeon HD 5700 series offers up to 10 SIMD engines, with up to 800 total Stream Processing Units. This is exactly half of the Radeon HD 5800 series offers as those cards have up to 20 SIMD engines and a total of up to 1600 Stream Processing Units. Since the Radeon HD 5700 series is literally half of a Radeon HD 5800 series core, all the other specifications are also reduced by half. That means you now have up to 40 Texture Units, 64 Z/Stencil ROP units, and 16 Color ROP units with a 128-bit GDDR5 memory interface. Why do we keep saying up to? Well, the Radeon HD 5770 has 10 SIMD Engines and Radeon HD 5750 has 9 SIMD engines. Since each SIMD engine contains 80 stream processors that means the texture units and performance will obviously be different. The Radeon HD 5700 series is manufactured with 40nm technology and has a transistor count of 1.04 billion. This makes sense as the Radeon HD 5800 series has 2.15 billion transistors. With half the numbers of transistors the Radeon HD 5700 die will be much smaller, cost less, and be more energy efficient than the Radeon HD 5800 series. In this review we will be looking at four graphics cards. The first pair of cards that we will examine are some Radeon HD 5750's. One is an ATI reference design and the other is a retail boxed version sent to us by Sapphire. Both of the cards feature 1GB of GDDR5 memory, which means they are each $129 variants. 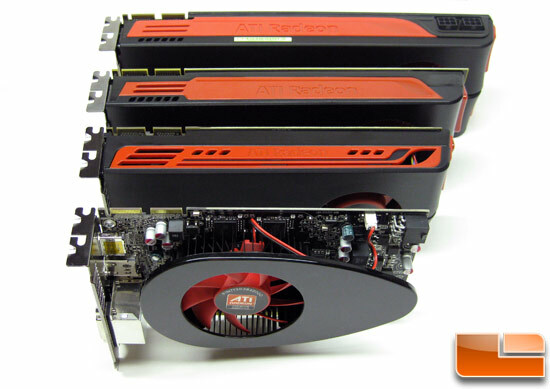 The Radeon HD 5750 features nine SIMD engines for a total of 720 stream processors at 700 MHz. The memory is clocked at 1150 MHz and the compute performance of the Radeon HD 5750 is just over the 1 TFLOPs barrier! For just over $100 this card looks impressive on paper and will you take a look at the power consumption of the video card? The Radeon HD 5750 uses just 16W of power at idle and 86W at load! The big brother to the Radeon HD 5750 is the Radeon HD 5770 and it has one more SIMD engine for a total of 800 stream processors running at 850 MHz delivering up to 1.36 TFLOPs of compute power. Idle power consumption is still impressive though as it is only 2W higher at 18W and the maximum board board is at 108W. Both cards need a 6-pin PCIe connector, but that shouldn't be an issue for any recent system that has a PCI Express x16 slot inside. 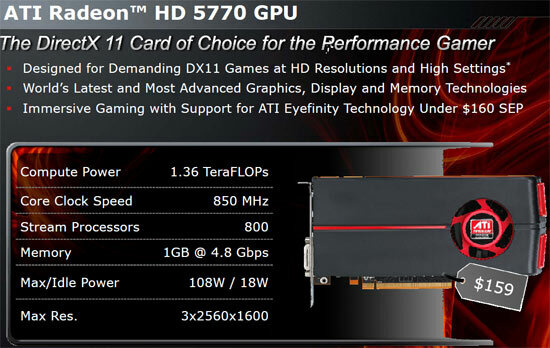 The 1GB of GDDR5 memory on the Radeon HD 5770 is clocked 1200 MHz. · Page 9 - Tom Clancy's H.A.W.X.